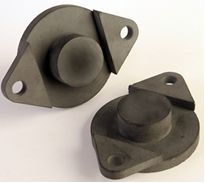 Injection molded friction parts for many industrial and automotive applications. Injected friction can be used to make stand-alone parts and combined with steel parts or high strength, light-weight thermoset cores. Brake and clutch parts are available for both wet and dry applications in a variety of friction levels. We have extensive experience in safety brakes, motorcycle brake and clutch and gear-tooth facings. Our high-speed manufacturing results in extremely precise parts at very competitive costs.